I have but a very few moments to thank you for a most kind letter & for the Cheque for 5£ it Contains. I shall like to hear that you & Lady Lindsay are pleased with the book. Yes: Knowsley is indeed changed since I first went there in 1832: — but it seems to me that perhaps yet greater changes are ahead. An autograph letter in which Lear writes to the art historian Alexander William Crawford Lindsay (1812-1880) on the R J Bush letterhead. After thanking Lord Lindsay for his ‘kind letter’ and expressing the hope that he and his wife are pleased with ‘the book’, Lear goes on to make the enigmatic reference, ‘Yes: Knowsley is indeed changed since I first went there in 1832 : – but it seems to me that perhaps yet greater changes are ahead’. 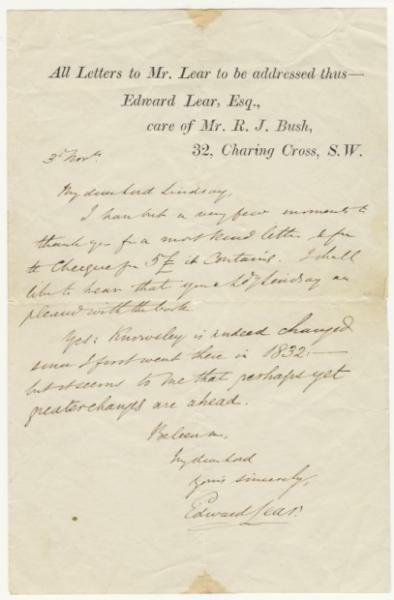 HISTORICAL CONTEXT: Lear’s use of R J Bush’s letterhead places the letter sometime between 1870 and circa 1877 – this being the time Bush was acting as his publisher. In addition, Lord Lindsay travelled extensively in Mediterranean Europe studying and collecting art which would suggest that the book referred to is Lear’s ‘Journal of a Landscape Painter in Corsica’. This in turn would date the letter specifically to 1870, this being the year in which it was published. This date possibly helps shed some light on Lear’s mysterious comment about Knowsley Hall that ‘it seems to me that perhaps yet greater changes are ahead’. The death of the fourteenth Earl of Derby in October 1869 saw his son Edward Henry Stanley accede to the title. The two contrasted sharply with each other. The longest serving leader of the Conservative Party and three times Prime Minister, the fourteenth Earl had envisaged that his son would follow closely in his footsteps. However, although Edward Henry Stanley did serve under Disraeli, he failed to share the political sensibilities of his father with his sympathies laying far more with the Liberals with whom he would go on to align himself explicitly in later life. Given Lear’s familiarity with the family, it seems likely that this was possibly the ‘greater change’ to which he was referring. The Stanley family had played a major role in the development of Lear’s career. Lear first went to Knowsley Hall in 1832 when he was engaged by the Thirteenth Earl (Lord Stanley) to draw the animals in his extensive menagerie (one of the largest private Zoological gardens in Europe) and it was whilst here that Lear began writing limericks for his patron’s grandchildren – limericks that would later be published in his ‘A Book of Nonsense’ in 1846 along with his ‘Gleanings from the Menagerie and Aviary at Knowsley Hall’. Lear’s books of nonsense verse and limericks quickly gained a high profile in Victorian society and Ruskin even stated that Lear was one of his favourite authors. At the same time the rumour emerged that the real author of the books was Lord Stanley and that ‘Lear’ was simply a pseudonym derived from Lord Stanley’s title ‘EARL of Derby’. Lear later related how he had felt compelled to intervene when he overheard people discussing this theory on a train from London to Guildford, producing the name tag in his handkerchief, hat and coat pocket as proof that he really did exist (Ref: Preface to the 1872 edition of ‘More Nonsense’ – E Lear). Although the focus is often on his nonsense verse, it is worth emphasising that Lear was also a highly regarded artist of the time and even gave drawing lessons to Queen Victoria. In this vein, the recipient of the letter is Lord Lindsay (Alexander William Crawford Lindsay – 25th Earl of Crawford and 8th Earl of Balcarres (1812-1880)). Lindsay was a well known art historian with a particular focus on religious art and an early champion of the Italian Primitives (precursors to the aesthetics of the Pre-Raphaelites). He was also bother-in-law to Sir Coutts Lindsay who would go on to found the Grosvenor Gallery with his wife in order to provide an alternative venue to the Royal Academy for the display of the works of the Pre-Raphaelites and which would subsequently become a focus for the Aesthetic Movement. DETAILED CONDITION REPORT : 20.5cm x 13.3cm. 4pp with integral blank leaf. Mailing folds. Small semicircular stain circa 7mm diameter at the top and bottom edge of the vertical fold. Small (1mm) spot in bottom left corne. This entry was posted in Edward Lear and tagged Edward Lear, letters, travel, zoological illustration. Bookmark the permalink.